According to the Nantes tourist office, the latter one of the great cheapest French cities at the hotel (in support study!) ... so good news, if you do not want to spend all your savings for a comfortable room. Limited budgets will get by with the little cheap, those looking to pamper themselves with a charm in a romantic atmosphere or eco-certified facility surely find happiness also ... For it find, here is a price range of Nantes hotels: -Not expensive: 20 euros / night (for a dorm bed ...). -Good market: around 40-50 euros / night (double room / studio for 2 people in residence). -Price average 60-80 euros / night (double room in 2/3 stars). -Comfortable: over 90 euros / night for a double room. -Top range: above € 150 / night (4 star standard). How to book your hotel? The simplest and most practical remains to go through the internet hotel booking sites (eg Booking). These allow to browse and easily compare all of the hotel offer Nantes, based on price. Customer reviews are a valuable source of information to get a clearer idea of ​​the quality of a hotel (tourist presentation of the texts are not always very objective!). The occasional specials are many bargains to be seized; please book in advance when cancellation is free, and regularly check the offers, in case ... The Nantes tourist office website is also a good research base. The latter brings together many Nantes addresses in all accommodation categories. The tourist office offers an interesting offer for the weekend: Offers 3 = 2 for 2 nights booked weekend, a 3rd is free! Nantes has a varied offer of accommodation, sometimes classic, sometimes innovative, like the city itself. Thus, you will find hotels of all kinds but also many alternatives if you fancy testing new modes of accommodation ... -Hotels 4 and 5 star luxury the fans might be disappointed, there is no 5 star hotel in Nantes ... It still remains 4 stars: some offer excellent benefits, a modern , functional, or more historic and creative ... special mention for the Sozo Hotel, one of the leading hotels in the city. -Hotels 2 and 3 stars: the most represented categories, with varying quality course addresses; ask before booking. Prices have nothing exorbitant in all, it is quite possible to find a great hotel, location, service, comfort ... while maintaining a reasonable budget. -No classified and 1 star: a few small hotels that do not pay mine with their one star, but remain well located in the center and offering double rooms for around 50 euros a night, with a more than acceptable comfort .. . -Hotels eco-certified Nantes is a city that focuses on sustainable development, and many of its hotels are not well. Several environmentally friendly addresses for a green holiday. 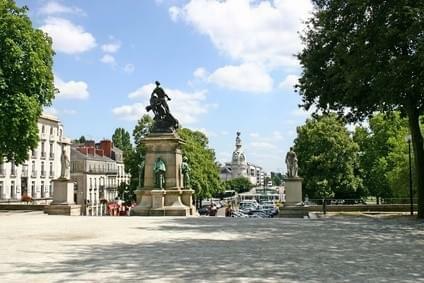 -Maisons guest: you will find guest rooms in the historic center of Nantes and in the vicinity (Nantes Métropole). The quality of the reception and breakfast make all the difference. -Apartments furnished holiday residences: a studio apartment rather than a hotel room, the formula is on the rise everywhere in France. The convenience of a furnished apartment, autonomy during the stay, but the savings by sharing with others (family, friends ...) are all strong points. Tourist residences and apartment rentals are available for a few days in Nantes. Many large cities are problematic for small budgets when they seek shelter. In Nantes, however, the hotels do not appear prohibitive prices, while solutions exist to sleep cheap while enjoying their stay. Solutions to stay in the economy in Nantes: Youth -L'auberge: there is a youth hostel '' official '' in Nantes, that is affiliated with Hostelling International (which offers certain guarantees, comfort, cleanliness, price ...). This is the least expensive solution for lodging while enjoying a good situation in the city (near the station). Overnight in dormitory from 20 euros. Book in advance as places are limited! -Small hotels as we have seen, Nantes has some small cheap hotels, without the quality of services would collapse ... Take a look around the station and the Botanical Gardens for some addresses friendly and very affordable. -The hotel residences: there sometimes loses much charm, but good for a studio around 40-45 euros shared by two, we put her tastes aside in favor of his wallet! -The campsites: camping is present in close proximity to the city center of Nantes, and is rated 5 stars! The others are more eccentric. As always sleep outdoors in a tent is less expensive than to pay four solid walls ... an economical solution as long as the season is right. What neighborhood sleep in Nantes? A brief overview of the most delightful parts / practices / Wanted Nantes: -The city center: in a wide perimeter around the place du Commerce, Nantes has all sorts of hotels. Obviously the situation is ideal to visit the city, with restaurant, shops, activities, places to go, cafes and walking distance to bars. The tram allows you to move easily around Nantes ... -The Castle of the Dukes of Brittany: between the castle, the Holy Cross Church and the Cathedral, in the historical streets, you will find quality addresses, location and context to support. -The station area: many hotels are scattered around the station and the Jardin des Plantes. Very obviously convenient for traveling by train, the city center is accessible on foot, by bus or tram ... maybe not the nicest neighborhood night however. The Island of Nantes few hotels are present on the Ile de Nantes. Go walk there as much as desired, but prefer a more central location to easily explore the city. -The Beaujoire: with the stadium and the exhibition center in the area, the hotels around the Beaujoire are primarily functional and practical. Given the peripheral location, not great for anyone wishing to visit Nantes on a weekend.